What's on Walt's Project Table RIGHT NOW??? Those Amish are mad as heck, by golly, and NOT going to take it any more!!! Remember the harassment scene in WITNESS, where Harrison Ford beats the snot out of a local punk for hassling the Amish? Start from there, but assume the Amish aren't pacifist any more. Amish Rake Fight (ARF) is a skirmish game of politically incorrect violence and mayhem-- pitting Amish farmers and farm implements against switchblades, shotguns and chains. Will numbers and righteousness win out over technology? Tune in at COLD WARS 2002, Lancaster PA, at the Lancaster Host hotel. Yes, I know the picture is crummy. Currently just converting various figures to Amish people. LE GRAND CIRQUE is my conveyance racing game-- Victorian era contestants compete against each other to get their vehicles across the track either in first or second place. Conveyances are powered by steam, electricity, clockwork mechansism, wind, even magic. This year's action takes us to mystical Egypt, to the site of a major archeological dig. The course weaves its way around two pyramids, a zigguraut and the Sphinx. Who knows? Maybe Ramses himself will take part this year, brought back from the dead by all the excitement outside his tomb. Currently making pyramids and painting mummies. 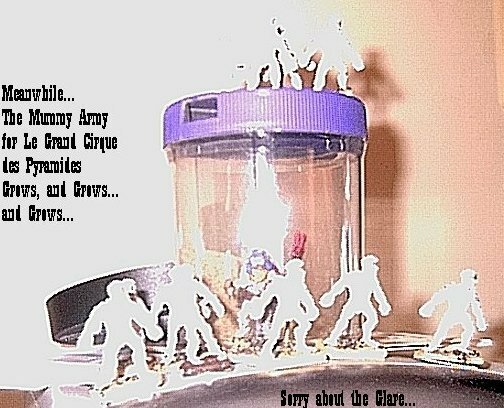 Here's a very bad picture of "The Mummy Squad", drying off after new bases. The "Lead Mummy" is a Reaper Figure, the "Hero Mummy" is another Reaper fig, the rest are some Heroquest Mummies I bought in bulk via Ebay. Five bucks. Actually, the Reaper figures cost me more than all those Heroquest plastics combined. Last, we have the Red River Valley GASLIGHT campaign, based in my Texas-Prussia War universe, using GASLIGHT rules. Dave Markley will be running this at Cold Wars 2002, I will be assisting. I've done some small work on it (the Wabash terrain is part of it). Mostly painting Prussians and Texicans. I have found some nice terrain finds lately, which I might contribute. Check out this house I found at Wal-Mart. 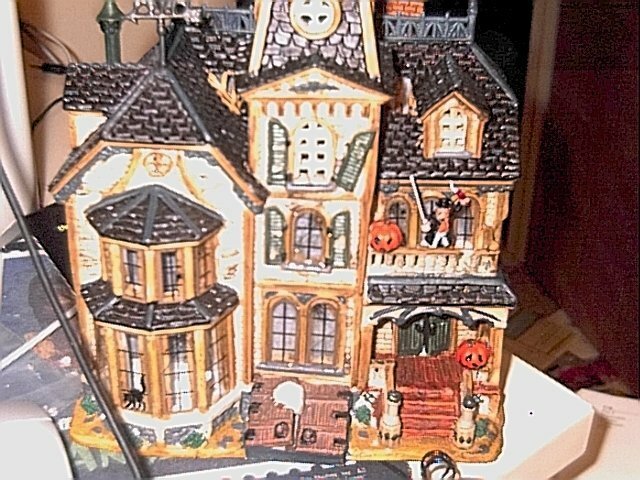 It's ceramic, part of some Halloween version of those "Santa Village" sets you find around Christmas time. A little hokey, but it's in scale and it paints up well. I'm dry brushing the slate roof, and adding some stain on the walls to give it more depth. I may add some flock on the base, as well. Note the figure on the balcony-- this house scales very well. I'll keep you posted on new developments.